A dirty bed bug job, a dedicated PMP, and a cooperative client. Plus a bonus. Pest control professionals are on the front lines every day protecting the health and welfare for their clients and for the public. It’s not uncommon for the professionals in this industry to go the extra mile to solve a tough problem and relieve the discomfort, anguish, and even health issues that can arise from a particularly heavy pest infestation. And it’s truly a wonderful day for any pest control professional when they have the full buy-in and cooperation from the client on those really tough pest control problems. It makes the job a lot easier. It’s even better when there is a bonus at the end of a very tough job. This is one such tale. On a hot steamy day in mid July I met with a local PMP who was about to undertake a particularly difficult assignment in a small rural community outside of Memphis. When I arrived a little before 10 AM, the temperature was already 93 in the shade and heading to 97 or higher for the day. Mid July in the south can be like that. But in spite of the heat and humidity, this was going to be a good opportunity to see EcoRaider in action on a heavy bed bug infestation. A 92 year old woman was being eaten alive by bed bugs, and her family had returned from Michigan, California, and Alabama to help. Grandma had been a seamstress and quilter in her younger days. In addition to the accumulation of old books, papers, furniture, and favorite knick-knacks, grandma had accumulated boxes and boxes of remnants and scraps that were part of her trade. Some were nearly as old as she was. To her, they were an important part of her past, her history, and her memories. Relinquishing possessions, no matter how mundane, can often be difficult and emotional, especially for the elderly. And that was the case here. Like many of her generation, she grew up in a time of poverty and discrimination, lived through the Great Depression and World War II years, worked hard, sacrificed for her family, and her children and grandchildren were able to better themselves and become successful. Now they were back to help. And they had followed the PMP’s pre-treatment instructions to a tee. The PMP had talked with one of the local family members in person, and with the rest of the out of town family by phone to lay out the plan prior to treatment day. The house was clear and ready. The family had moved the furnishings outside under a carport or under the shade of old oak. Clothing had been bagged to take to the nearest laundry. They did everything right. Bed bugs had taken over the ramshackle old house. They were everywhere – in the carpet, behind the floor and window moldings, the door frames, in the sagging drop ceiling, even in the bathroom. And of course, the mattress, box springs and other furnishings were heavily infested. This was not a good or healthy environment for anyone, much less a rather frail 92 year old. By early afternoon, after a long and very hot day and a lot of hard work, the entire job was finished. All that was left was to vacuum up the bed bug debris. Steam had been used for the initial knock down, followed by EcoRaider for extra penetration, kill insurance, and for residual. Everything was treated; floors, window moldings, ceiling areas, and furnishings. For the mattresses and upholstered furniture, using steam on edges and crevices and an application of EcoRaider on the edges and surfaces, most of the furnishings were salvable. This was a bit of a bonus for the family who had planned on replacing all or most of the furnishings. That money could now be put to use for other things that grandma might need in the future. By the time we left, we all felt pretty good about the job. The family returned to the local motels where they had been staying and where grandma was resting comfortably out of the heat, and out of reach of bed bugs. Tomorrow they would return to move furniture back inside and put the house back in order. After about two weeks I had almost forgotten about that hot summer day in the country. I got a call late one afternoon from the PMP who had done all the detailed work to rid this family of the bed bug infestation. She told me that her follow-up inspection came up clean. 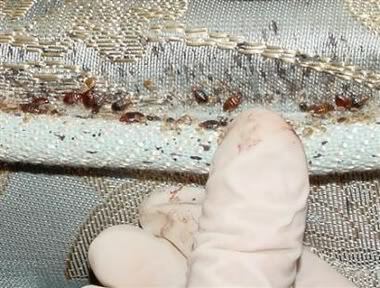 She only found one bed bug on a throw pillow, and likely it was one that had been brought back in after the treatment. Good news indeed. Everything worked. EcoRaider did its job. And a hardworking, detail oriented PMP did hers. But she also told me there was more good news. After I had left, the family paid the bill in full – and much to her surprise gave her a bonus of several hundred dollars extra in appreciation of all her hard work, attention to detail and professionalism in dealing with this very difficult problem. And I could tell that she was touched by that gesture. But there’s more. One of the granddaughters (who was pretty much ‘in charge’ for the whole operation) had been wearing a Disney character t-shirt on treatment day. Our PMP had mentioned that she was a Disney fan and she and the ‘in charge’ granddaughter chatted a bit about different Disney movies and characters while the work was going on. Just casual conversation. But a week or so later, our PMP received a package of Disney merchandise, and a very nice thank you note from the ‘in charge’ granddaughter in California. This was just icing on the cake. A cash bonus and gestures such as this are probably quite rare in the pest control industry I would imagine. While important and noteworthy in themselves, more significantly, that bonus and gesture of appreciation was a tangible symbol and recognition of a job well done, a problem solved, and of true pest control professionalism at work. And we at EcoRaider were proud to play a part in it.